Lean MRP is a capital cost-free Lean Manufacturing methodology for improving on-time performance, lead times, and WIP inventory. This is not the usual “yada-yada”. The concept of Lean MRP is a novel one, which holds the promise of transformational change particularly in job shop environments. Lean MRP focuses on setting up a stable production schedule that effectively drives the shop floor rather than vice versa. Eliminating schedule date changes (i.e., volatility) is the first objective of Lean MRP, which gives the organization a production schedule that is rooted in customers' requirements rather than the ebb and tide of the shop floor. With a stable schedule, the second objective of the Lean MRP methodology is to establish a Lean shop floor control system that embodies the principles of pull-based flow using your existing ERP system. Effective customer-driven work priorities that eliminate the "whiplash effect", minimize WIP inventory, reduce manufacturing lead times, and more effectively promote on-time performance are the result. In addition to attaining the on-time performance, inventory, and lead time benefits of a pull system, Lean MRP can also help improve the accuracy of forward-looking schedule projections (i.e., estimated completion dates or ECDs) to enable more reliable promises to the customer, particularly during the initial quoting and estimating process. 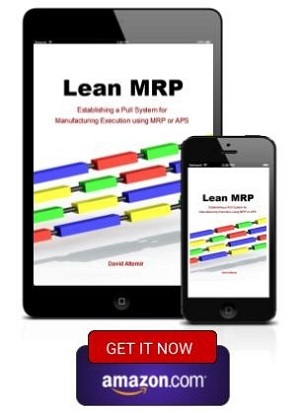 Lean MRP is for those manufacturing managers who have always strived for a Lean operation but nevertheless feel that a computerized system offers a more practical and scalable solution for managing a large, complex, and/or turbulent shop floor. Manufacturers in high mix industries such as contract manufacturing, aerospace, or industrial equipment can particularly benefit from this novel and innovative approach. For them, the prospects of Lean MRP offer an exciting opportunity to positively and comprehensively transform the whole of their operation as opposed to accepting isolated islands of Lean improvement that only skirt the periphery of the on-time performance, inventory, and lead time challenges they face. Contact us to see how we can help your operation break through to the next level of performance using your existing systems.